Northern Nightmare, El Toro Loco and Grave Digger owned BC Place last week. A fourth monster truck, Maximum Destruction, was more appropriately named considering the pitch quality here in Whitecaps land. Toronto FC’s Steven Caldwell scoffed at the pitch following Friday’s training. There isn’t much worse, either. The turf ahead of Saturday’s opener is dry, matted and no softer than a living room rug. Evidently that’s what a blanket of dirt does when laid over artificial turf. At least the exhaust smell is gone. “Nah,” Caldwell remarked when asked about the surface, his face stretched as if he just bit into a lemon. Toronto’s centre back added another disparaging comment as he started to trail off. “I hope they water it,” Altidore remarked. There is a common rebuttal: Both teams have to play on it. Which just about everyone agrees is fortunate following what Caldwell described as “tense” labour negotiations earlier this week. With that behind them, the Reds arrived in Vancouver Thursday ready to embark on what is expected to be a landmark year at the club. Similar to last year’s opener, this all-Canadian matchup could garner some of the highest TV ratings the league has seen in this country. 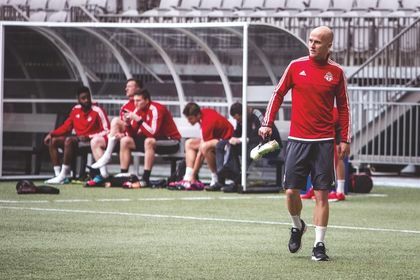 “When you talk about what it’s like playing in Vancouver it’s important that everyone who walks in with our club knows what goes into it,” TFC’s Michael Bradley said following training. The growing rivalry. Bragging rights over Canadian supremacy. The uptick in urgency now that points are on the line. “They’re physically talented,” was Bradley’s critique of the ’Caps. “You have to respect their ability athletically. They try to dominate games that way. Expect Carl Robinson’s Whitecaps to use that physical presence to press the issue from the first whistle. In his second year as ’Caps coach, the former TFC captain said he expects the Reds to keep things tight in the first 20 minutes despite the disparity in payrolls. Toronto FC, of course, enters 2015 with a near-record payroll of around $23 million. The ’Caps, though, are a relative mid-major in terms wages. “Big money signings,” Robinson said of TFC, his go-to phrase in the buildup Friday. “You expect to get fantastic players (for that price). “I’ve got young players on less money, but who are in my team to make a difference. The battle between Altidore and the home side’s towers of power — centre backs Kendall Waston and Pa-Modou Kah — highlights a plethora in intriguing matchups all over the park. Waston and Kah have proven to be rash during their brief time in Major League Soccer — and Saturday should be no different. Look for the hosts to “close down space,” according to Robinson. Or, in other words, for them to make it known — fairly or unfairly — that Altidore and Giovinco are in for a battle. Toronto FC bench boss Greg Vanney was a bit more cheeky in his analysis of the pending brouhaha. Towards the end of pre-match training on Friday, Vanney pulled Giovinco aside to practice restarts within goal-range. The Italian international lined up five, beating reserve goalkeeper Chris Konopka twice while putting his other three attempts off the crossbar. If the Whitecaps minimize the influence TFC’s top two attackers have throughout Saturday’s match, the ’Caps could potentially exploit a few of the question marks the Reds left pre-season with. In terms of width, the right side of Toronto’s lineup is facing a massive test. First and foremost, both Robbie Findley and Warren Creavalle aren’t naturally wide players. Both are expected to start Saturday, with Findley in front of Creavalle at fullback — a bit of surprise given Vanney left a natural fullback in Toronto. Mark Bloom, who signed an extension with TFC during the off-season, will be a healthy scratch. It’s unclear if that progression was significant enough to keep up with Kekuta Manneh’s pace. Vancouver’s 20-year-old striker, who many consider the league’s brightest young star, will feature somewhere behind Octavio Rivero, a powerful Uruguayan striker the ‘Caps signed as a young, much cheaper Designated Player this winter. But as Robinson repeatedly alluded during his pre-match chat, it’s the Reds who currently operate as the league’s biggest spenders. And that’s before factoring in the playing surface — which will be fairly foreign to most of Toronto FC’s off-season acquisitions. VANCOUVER — Some players weren’t expecting to show up to Saturday’s match. Throughout the league’s tense collective bargaining process earlier this week, one of TFC’s union representatives confirmed he had doubts the Reds would board a flight to Vancouver. “There were a number of times when we all thought we weren’t going to be playing,” Michael Bradley said. “It has been a long process in every way. Details continue to trickle out as to what the league’s new five-year agreement with its players actually says. ESPN’s Jeff Carlisle reported Friday that the league’s salary cap will jump up to a max of $3.7 million, with clubs still allowed to pay three Designated Players anything over and above that. Roster sizes will decrease from 30 players to 28, with the average, non-DP salary expected to jump up to just under $200,000 when it’s all said and done. It has already been confirmed that MLSers will finally be able to reach free agency if they are 28 years old with at least eight years of experience within the league. It has been widely reported that at least seven MLS clubs voted against the proposal that eventually passed, with Toronto FC being one of the other 13 clubs that voted to approve the deal. Caldwell admitted it’s difficult to explain to his buddies back in Europe, where player contracts are guaranteed and free agency has flourished, what the league’s single-entity status actually means. To a little more than half the teams, at least. VANCOUVER — Ontario Lottery and Gaming is making things more interesting for Major League Soccer matches this season. After first allowing bettors across the province to gamble on MLS matches a few seasons back, odds-makers are adding in a new wrinkle. For the first time, bettors can wager on an over/under total for goals scored in a match. For instance, the over/under for Saturday’s Toronto FC-Vancouver Whitecaps match has been set at 2.5 goals, with the over bet paying out 2-to-1. Despite all of TFC’s off-season additions, the Whitecaps are currently favoured to win here at BC Place.